Our best cold packs! 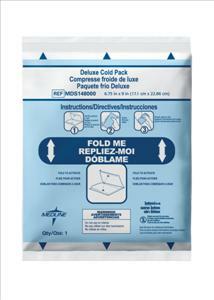 Deluxe Cold Packs are a sweatless, paper covered poly nylon bag, that can be applied directly on the skin and don't require a compress holder. They need no refilling, require no clumsy ties and stay at a lower consistent temperature longer than other cold packs. Single use. 7" x 9".